“Everyone has a plan,” the great American boxer Mike Tyson once quipped, “that is, until you get punched in the face.” Saudi Arabia, as the world knows by now, has a plan. In fact, the Saudi Vision 2030, unveiled in dramatic fashion in April 2016 with a roll-out similar to the launch of a new iPhone, has become one of the most well-known national transformation plans in the world. It has become almost a by-word for the changes dawning in the Kingdom, and the calling card for the reformist credentials of the Crown Prince Mohammad bin Salman. Though he fancies unpredictability a useful negotiating tool, President Trump has been remarkably consistent about the Middle East. He campaigned against the Iran nuclear deal and in May 2018 withdrew the United States from it. He promised, as most presidential candidates have done, to move the American embassy in Israel to Jerusalem. Unlike any other successful candidate, he actually did it, also in May 2018. Saudi Arabia is undergoing a perilous, but essential transformation. Those wishing to safeguard one of the last bastions of Middle East stability should support Crown Prince Mohammad bin Salman’s (MBS) dramatic socioeconomic reforms and also appreciate the challenges, resistance, and limitations amid which he is forced to operate. As rapid reform risks destabilizing the kingdom’s broad and deeply divided political base, rule by consensus will not work. Only a strong hand can balance Saudi Arabia’s competing constituencies. Saudi Arabia, a kingdom grounded in a dynastic religious alliance, stands at a crossroads. Some observers and journalists, both Western and Arab, eyeing the new assertive leadership of Crown Prince Mohammad bin Salman (henceforth MbS) and his promised economic and social reforms, have rushed to declare him a ‘reformer’. Effective US policy toward Saudi Arabia requires familiarity with the intricacies of its history and society, of course. 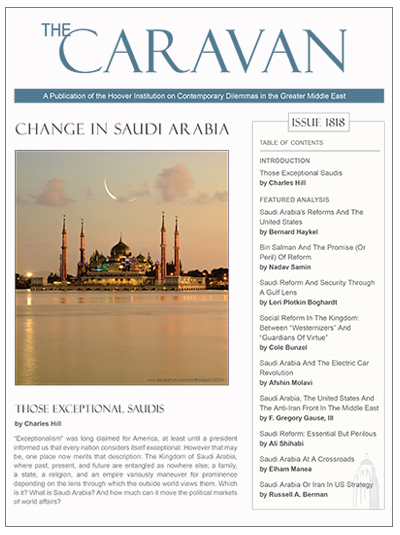 The legacies of the foundation of the state, the traditional collaboration of political and religious leadership and the burdensome privileges of the extended royal family still weigh on the Saudi present, even as new circumstances develop, especially the ambitions of the young generation, eager for the reforms promised by the bold leadership of the Crown Prince.